Okinawa kenjinkai/association in Los Angeles, California. Please contact your nearest kenjinkai/association to apply! 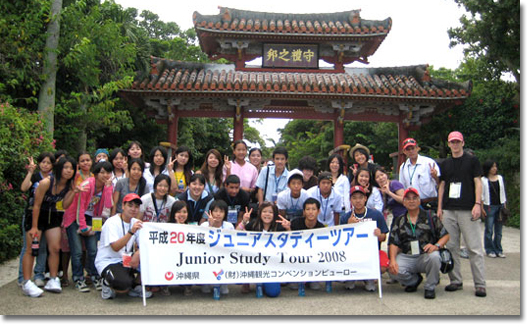 The Uchinaa Junior Study Program (formerly the Junior Study Tour) is an annual immersion program that brings middle and high school students to the islands of Okinawa. Sponsored by the Okinawa Prefectural Government, elected students are given an all-expense-paid trip to study Okinawan history, culture, society, and diaspora, with an emphasis on nature, peace, and identity. Students will also be given the opportunity to interact with Uchinaanchu from around the world as well as students from Okinawa, with the hope that bonds and understandings will develop between overseas Uchinaanchu and their mother island. It may be delivered in person, mailed, or emailed, but it MUST be in the OAA office before 4:00 PM (Pacific Standard Time). The application process is extensive, so please do not wait until the last minute.